Do you madly cling to Apple devices? With the introduction of the new iPad on March 7, 2012, you surely make it your own since the tablet touts thoroughly new features like Apple's new A5X chip and stunning new Retina™ display with 2048-by-1536-pixel resolution at 264 pixels per inch, thus bringing you a great visual feast. So the pad unquestionably becomes the best tool to watch DVD movies. Of course, you can enjoy videos anywhere with the new iPad via Wi-Fi. However, are you in a jam during travel or outgoing as you cannot access to internet? Worse still, you may have such experience that additional money has to be paid for watching the DVD you have already purchased. Alas! Don't you think it is a waste of money? Under the circumstance, it is wise to rip DVD movies to the new iPad 3 so as to enjoy them on the go, even offline. Therefore, a DVD ripper is on demand. Surely, you can find a lot of DVD rippers in the market, many of which cannot function well due to DVD copy protection. 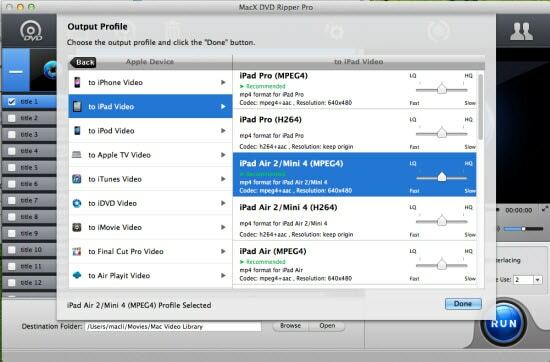 Take it easy, MacX DVD Ripper Pro helps you solve the problem and rip DVD to any format recognized by the new iPad. Best DVD to iPad 3 ripper for Mac (El Capitan included) to rip and convert DVD to iPad 3/iPad Pro/Air 2/mini 4 etc with no quality loss and 36x faster speed! MacX DVD Ripper Pro is the best DVD ripping software, specially designed for ripping DVD to iPad for Mac users with ease, even the newly published tablet. What's more, this DVD to iPad 3 ripper for Mac is versed about stripping commercial DVD of copy protection, even the latest one, so that you can smoothly rip DVDwithout worrying about encryption. After download MacX DVD Ripper Pro , insert your DVD movie into your DVD drive and click "DVD Disc" button after your insert the DVD. If you have already saved the DVD as DVD folder, click "DVD Folder" to import DVD folder. Select the target format "to iPad and Tab" button. Step 3. Select Output Folder. Specify the output folder by clicking the "Browse" button to choose the output path where you want to save the output files in. Click the "RUN" button at the lower right corner to begin DVD to the new iPad 3 ripping process. Tip: After the DVD to iPad conversion is finished, you can eventually transfer DVD movies to iPad for limitless playback via iTunes or its alternative MacX MediaTrans. How to copy DVD to iPad 2? MacX iPad DVD Ripper helps you rip DVD to video format fully compatible with iPad 2. It is the best DVD to iPad 2 Ripper for Mac to convert DVD to iPad 2 perfectly.